“Ned Kelly woz here, ’78” was not inscribed on the old River Red Gum standing on Gooram Falls (pictured above), but I reckon there’s a good chance he and his fellows may have spent time here as they planned the raid on the National Bank at Euroa on December 10th, 1878. These waterfalls are a well-known local feature where swimmers and picnickers have idled away many sunny afternoons (and moonlit Saturday nights). Located on the Sevens Creek as it descends the western face of the Strathbogie Ranges and about 18 km south of Euroa, it would be an idyllic spot to plan a bank robbery. It may even be that the site was too popular for the gang to stop by after the Euroa bank job. 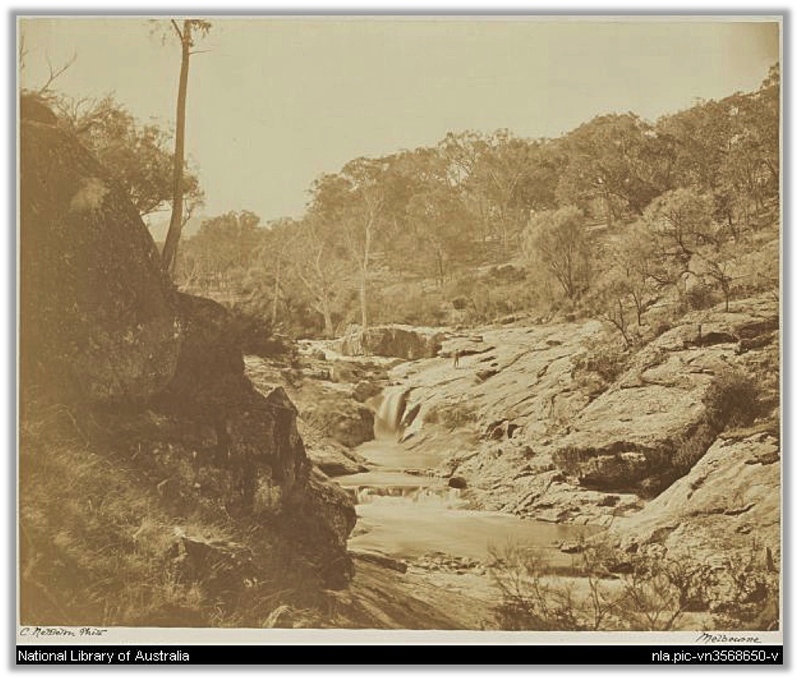 The image above is in the National Library of Australia and is labelled “Waterfall, Big Hill, Seven Creeks, 1874”, and so presumably was popular enough at the time for some-one to take a picture with people in it. (The photographer, Charles Nettleton, has some 400 photos dating from the 1870’s lodged with the NLA, including Gooram Gooram Gong (view towards Mt Wombat) and a Station near Longwood (‘Sevens Creek’)). Never-the-less, rumours at the time had it that the Kelly Gang was nearby, with one report in The Argus (14 Dec 1878) of “four saddled horses answering the description seen at Big Hill on Wednesday”. The Kelly Gang had plenty of sympathisers throughout the Strathbogies, so stopping here for a bit may not have been all that risky. 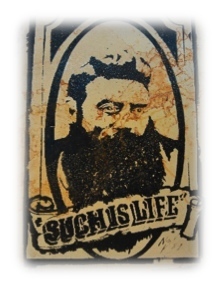 In fact, the Gang is said to have spent the next 18 months hanging out in the Strathbogies, with the exception of a couple of weeks sojourn to Jerilderie, to post that letter (nedkellys.com.au/neds_history.html). I decided to re-photograph the site after being shown the original image (sourced from NLA’s ‘Trove’) by Ian Lunt from Charles Sturt Uni. (Ian has some great posts on environmental history and other ecological insights.) Crossing the Sevens here in spring is not an easy task, but eventually I found a fallen tree to climb across and track back to a point where I reckon the original photo was taken. The signature River Red Gums in the middle ground of the photo are still standing, very much as they were in 1874. Below are the two images side by side. How old could these trees be? I measured one of the trees (the one above the vertical rock face, arrowed) which today has a diameter of approximately 90 cm. The normal measurement is taken at 1.4 m off the ground (“at breast height”), but I actually reached up to get above the bole and to a height I figured would be visible from the point where the photo was taken, and not obscured by the large rock. I enlarged the 1874 image until the vertical rock face measured the same in both images (assuming the rock hadn’t changed much! ), and then measured the tree in that image – at about 60 cm. From these estimates, the tree had increased in diameter by 30 cm over the past 140 years, that is, about 2mm / year. At this rate it could be up to 430 years old, and yet it is certainly no giant. (Without these estimates I would have said it is maybe 150 – 200 y.o.) But a trees’ girth doesn’t increase at a consistent rate. Dr Matt Colloff has recently published a wonderful book about River Red Gums (entitled “Flooded Forest and Desert Creek: Ecology and History of the River Red Gum” and available from CSIRO Publishing) so I decided to ask him about growth rates after an unfruitful attempt to google an answer as to how fast / slow River Red Gums grow. As I suspected, there is no clear answer. Plants allocate energy to whatever part of their ‘body’ is in most need depending on growth stage and environmental factors. During severe drought available resources will be used to simply stay alive. If a tree has lots of neighbours competing for space and light, and sufficient resources are available, it can direct its energy to vertical growth to capture as much sun as it can. From the very few studies available, Dr Colloff was able to confirm that an increase in diameter of between 1 – 4 mm / yr is quite reasonable, and that for a tree with good water supply but limited nutrients (these ones are growing on granite rock), 2 mm / yr is very much in the ball park. However, if we assume that these River Red Gums don’t have a particularly high nutrient demand and water is readily available on the Sevens, growth rates during the middle part of the trees life (b/n 30 – 60 cm dbh) may have been up to 4mm / yr. So, conservatively, the tree could be at least 300 years old. Whatever, these trees were quite mature back when Ned rode by, and are still doing fine today. And yet while these two particular trees have changed little since days when Ned and friends may have camped nearby, the surrounding vegetation does appear to have changed (as shown in the two images), especially the shrub layer. The main shrubs (Varnish Wattle and Fringe-myrtle) may be responding to conditions resulting from the last fire, which according to locals was the Strathbogie fires of 1990 when thousands of hectares and hundreds of buildings were burnt. As these shrubs die off (which is what is happening with Fringe-myrtle en masse), could the landscape return to a more 1870’s type of appearance? Is a more open woodland more preferable? I figure if you’re a small bird or mammal, possibly not. On the other hand, a larger hunter on the lookout for prey may like it. As I mused in the late afternoon about the woodland at Gooram Falls I could hear the sounds of horses and riders on the road above, which was kind of eerie as the same sounds could have been made 140 years ago. When I mentioned this to Matt Colloff, he wondered whether the Kelly gang’s DNA could be lingering in the biofilms growing in the pools in which they may have washed? Such is life…..
For people interested in the uses and application of repeat photography, Ian Lunt has an interesting blog post about it here http://ianluntecology.com/2014/02/02/snapshots-of-change-repeat-photography-competition/ Make sure you read the comments at the end. Previous Previous post: August rainfall – what was that all about?